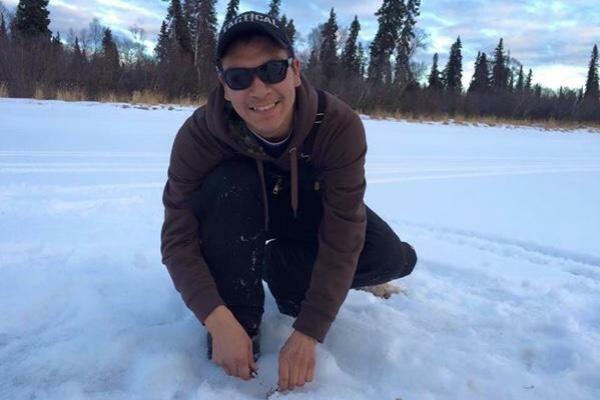 Bruce "Gotor" Morgan, age 24, was shot and killed in his truck in Aniak on Sunday morning. Credit Courtesy of Audrey Leary. The community of Aniak is struggling to recover from a recent shooting spree that saw bullets flying though town and left one resident dead and several wounded. Aniak resident Joseph Yaska, age 29, is accused of shooting a woman twice in a domestic violence incident as she fled from a home in the early hours of Sunday morning. He then allegedly armed himself with an AK-47 assault weapon and shot into homes throughout the quiet neighborhood, targeting people on the street nearby. According to State Trooper Nicholas Hayes, residents heard three volleys of loud shots. "We were getting calls from all over the place of people hearing different things, seeing different things," Hayes said. "And then people started reporting getting shot." Yaska is accused of shooting and killing Bruce “Gotor” Morgan, age 24, while he was sitting in his truck. The woman he is accused of shooting is recovering from her injuries and Hayes says that she was not the only Aniak resident who was hurt. "Other people received injuries due to shrapnel, whether it was glass or fragmentation from the casings," he said. "There were a lot of injuries." Hayes added that while the initial shooting happened quickly, it took several hours to find the shooter. There aren’t any tribal police, village police, or village public safety officers in Aniak. A single State Trooper, Anthony Wiles, was in town when the shooting started. His neighbors banged on his door at about two in the morning and helped him locate where the shooting was taking place. Wiles then evacuated residents from their homes, and ultimately apprehended Yaska himself. "This is really kind of a gut-punch for the community here," said Kevin Toothaker, Aniak's City Manager. "If it hits one person [here], it hits everybody, in a way." According to Toothaker, Aniak is a tight-knit and thriving community, the kind of place that many people find oddly healing. To have a shooting happen here, of all places, feels surreal and Toothaker places some of the blame on the village’s lack of law enforcement. He said that he plans to write a letter to Walt Monegan, Alaska’s Commissioner of Public Safety, about the situation and is trying to figure out how Aniak could pay for an increased police presence. "We don’t have a deep enough budget to say, 'hey, we need to go hire a cop,'" Toothaker said. In the meantime, the Troopers are continuing to interview witnesses and Aniak residents are banding together. Toothaker said that the Yukon Kuskokwim Health Corporation held a fundraiser this morning at the Aniak Clinic, where donors bought breakfast burritos or spam, eggs, rice, and bacon for $10 a plate. The proceeds will go to the family of Bruce Morgan to pay for the funeral and any other expenses. Delta residents can also support the Morgan family by donating to a GoFundMe campaign started by Audrey Leary. Toothaker added that Bernice Hetherington, a Behavioral Health Aide with the Yukon-Kuskokwim Health Corporation, is also traveling to Aniak to help residents process the event. Yaska was arraigned in Aniak yesterday morning. He is charged with murder in the first degree, attempted murder in the first degree, firing a gun at a dwelling, and three counts of assault in the third degree, or threatening another person with a weapon. He is also charged with two counts of assault in the fourth degree, or recklessly injuring another person. Yaska had several run-ins with the law prior to the shooting. A short-term protective order was taken out against him last year and then quickly canceled; he was prosecuted on two domestic violence-related charges in 2011, though one was later dropped. The woman who requested the protective order against Yaska is the same woman he is accused of shooting twice on Sunday morning. Yaska is currently imprisoned at the Yukon Kuskokwim Correctional Center in Bethel. His next hearing is scheduled for September 7 in Aniak. Correction: In a previous version of this story, we reported that Aniak's breakfast fundraiser was sponsored by the city, not the Yukon Kuskokwim Health Corporation. We also reported that Yaska was prosecuted on one domestic violence charge in 2011 that was later dropped, as opposed two two domestic violence-related charges of which one was dropped. Upon further reporting, we discovered and corrected both errors.